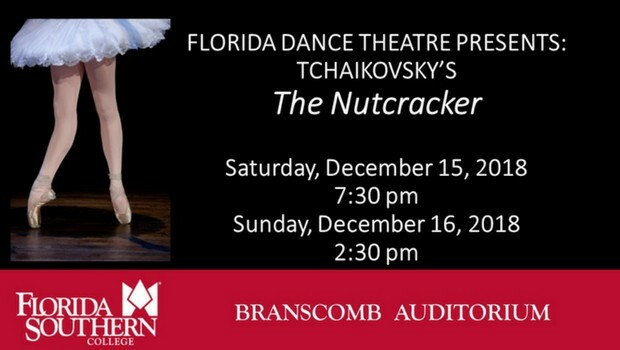 In celebration of their 25th anniversary, the members of Florida Dance Theatre (FSC’s company-in-residence under the direction of Carol Erkes), bring their classic holiday tradition of Tchaikovsky’s The Nutcracker to the Festival of Fine Arts. Come see this timeless holiday masterpiece, performed with charm and perfection by the dynamic dancers of this impressive ensemble in a breathtaking production featuring colorful scenery, dazzling costumes, and entrancing choreography. Please come bring your family and enjoy the music, dance, and spectacle that define the holiday season around the world. Saturday, December 15, 2018– 7:30 p.m.
Sunday, December 16, 2018 – 2:30 p.m.